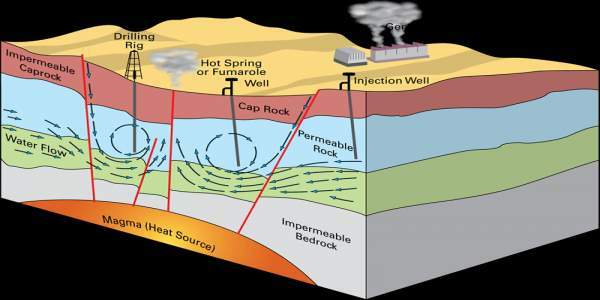 In engineering, geothermal energy definition is “The heat energy generated and stored in the Earth”. The prefix “Geo” is a Greek word, meaning Earth and the term, “Thermal” means Heat. If you put the terms together in the word geothermal, then geothermal energy meaning is, heat coming from the earth. So, I hope, you got the answer to the question, what is the geothermal energy? Now let’s go further. Another example of heat energy is solar power. If you like to know about solar energy, here you will find the detail information. There are two sources of geothermal energy; one is the leftover heat from the formation of our planet and second is the radiogenic heat. The radiogenic heat is the heat resulting from radioactive decay within Earth. Both heat sources are naturally occurring and provide abundant energy. This heat energy can be harnessed for human energy needs especially electricity. Among all the alternative energy sources, geothermal energy is the oldest one to wind energy or solar energy. Still, one question is always asked about this sustainable energy, is geothermal energy renewable? My answer to this question is YES, the inner core of our Earth is still hot and producing heat continuously. We can use this heat energy for next thousands of years with proper geothermal technology. Hence this is definitely a renewable energy source. Before going further, let me share some interesting facts about the layer of earth with you. So, you can better understand Geothermal Power. The inner core is solid iron and is surrounded by an outer core of hot molten rock called magma. Mantle surrounds the core and is about 1,800 miles thick. The mantle is made up of magma and rock. The crust is the outermost layer of the earth. It forms the continents and ocean floors. The crust can be 3 to 5 miles thick under the oceans and 15 to 35 miles thick on the continents. There is quite a rich history of geothermal energy. People have been utilizing geothermal heat for centuries. People have visited hot springs for cleansing and bathing since ancient times. This is actually a direct way of putting the heat energy to use. Archaeological evidence shows that the first human use of geothermal power is more than 10,000 years ago in North America. People used water from hot springs for cooking, bathing, and cleaning. The first industrial use of geothermal energy began near Pisa, in Italy. Steam coming from natural vents was used to extract boric acid. It was not until the start of the 20th century that geothermal power was used to make electricity. In 1904, Italian scientist Piero Ginori Conti invented the first geothermal electric power plant in which steam was used to generate the power. The first geothermal power plant is started in 1922 in the USA with a capacity of 250 kilowatts. It produced little output and due to technical glitch had to be shut down. In 1946 first ground-source geothermal heat pump installed at Commonwealth Building in Portland, Oregon. A first large-scale geothermal power plant is started during 1960 in San Francisco, producing 11 megawatts. In 1980’geothermal heat pumps (GHP) started gaining popularity in order to reduce heating and cooling costs. Today, 69 geothermal power facilities are in operation at 18 sites around the United States. At present more than 20 countries are harnessing thermal energy around the world. Geothermal power plants use hydrothermal resources (means water and heat) for electricity generation. Engineer use these resources by drilling wells into the earth and then piping steam or hot water to the surface. The hot water or steam powers a turbine that generates electricity. There are three basic types of geothermal power plants in operation to harness geothermal energy. Dry steam power stations are the simplest and oldest design to harness geothermal energy. They directly use geothermal steam of 150°C or greater to turn turbines. The unused steam is cool down in condenser and returned back to the soil in a water form. This is the most common type of power station in operation today. Flash steam stations pull deep, high-pressure hot water into lower-pressure tanks and use the resulting flashed steam to drive turbines. They require fluid temperatures of at least 180°C, usually more. 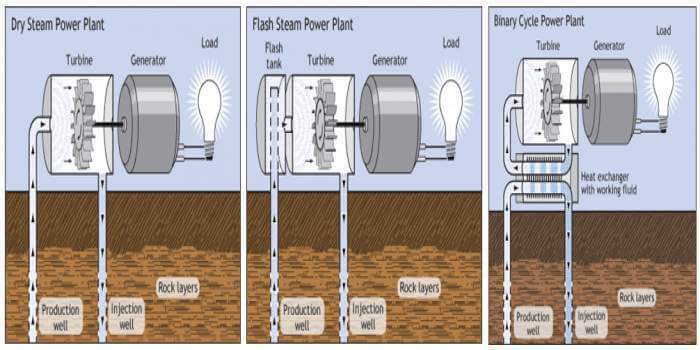 Flash steam plants use geothermal reservoirs of water with temperatures greater than 360°F (182°C). The hot water flows up through wells in the ground under its own pressure. As it flows upward, the pressure decreases and some of the hot water boils into steam. The steam is then separated from the water and used to power a turbine/generator. Any leftover water and condensed steam may be injected back into the reservoir, making this a potentially sustainable resource. Binary cycle power stations are the most recent development and can accept fluid temperatures as low as 57°C. The moderately hot geothermal water is passed by a secondary fluid with a much lower boiling point than water. This causes the secondary fluid to flash vaporize, which then drives the turbines. This is the most common type of geothermal electricity station being constructed today. The thermal efficiency of this type of power station is typically about 10–13%. Some of the common geothermal energy examples include the hot water springs which are used for bathing, cooking. Many people believe the hot, mineral-rich waters have natural healing powers. Hot water springs provide direct heat applications for heating buildings. Some power plants can utilize hot steam from vents in the Earth to generate electricity. As like other renewable energy sources, geothermal energy has also its own advantages and disadvantages. So, let’s first start with advantages and then after we will go for geothermal energy disadvantages. Geothermal energy power plants do not involve any form of combustion of fossil fuel. Hence they produce significantly few amounts of greenhouse gasses. Binary geothermal power plants, along with their flash binary counterparts emit close to zero greenhouse gas. The heat inside the earth is available around the world. So, with the rapid growth of technology, economic systems will be developed to convert this abundant heat into electricity. A geothermal system operates quietly. Hence it doesn’t produce any noise pollution. A noise pollution is a big issue in generating electricity from wind power which is eliminated in geothermal power. Geothermal reservoirs are naturally replenished. According to some scientists, the energy in the geothermal reservoirs will last billions of years. Hence geothermal energy is not going to expire anytime soon. Unlike other renewable energy technologies such as solar power or wind power, geothermal power is not dependent on the weather conditions. Hence you will get a constant energy supply for your geothermal power plant. The benefit of constant supply makes geothermal energy a far more predictable means of generating electricity. The initial setup cost of a geothermal power plant is considerably high when compared with the power plants that produce electricity from other non renewable energy sources such as coal and oil. The process Hydraulic Frocking is used to obtained energy underneath the surface of the earth which affects the stability of the land. This can lead to earthquakes. Although the earth’s heat is found almost everywhere, prime locations to set up a power plant are only found in selected areas. During the production of geothermal power, gases as like hydrogen sulfide (H2S), carbon dioxide (CO2), ammonia (NH3), methane (CH4), etc. can be released to the atmosphere. Some of which can contribute to global warming. Drilling into hot rocks is a daunting task. For any geothermal process to start, the required temperature must be present. A temperature lower than 350ºC may not be able to generate geothermal energy. Although geo energy doesn’t enjoy the popularity of other renewable resources such as hydroelectric, wind and solar, it’s an incredible, renewable and relatively cheap alternative energy source.